The Constitution Bench of the Supreme Court declared National Judicial Commission (NJAC) Unconstitutional as it violates Basic Structure of Constitution of India by 4;1 Majority. 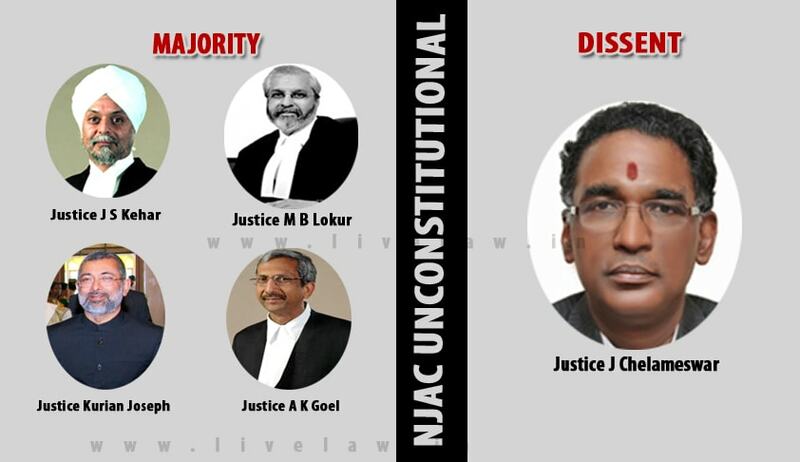 Justices J S Khehar, MB Lokur, Kurian Joseph and Adarsh Kumar Goel declared the 99th Amendment and NJAC Act unconstitutional while Justice Chelameswar upheld it. "Article 124A constitutes the edifice of the Constitution (99th Amendment) Act, 2014. The striking down of Article 124A would automatically lead to the undoing of the amendments made to Articles 124, 124B, 124C, 127, 128, 217, 222, 224, 224A and 231. This, for the simple reason, that the latter Articles are sustainable only if Article 124A is upheld. Article 124A(1) provides for the constitution and the composition of the National Judicial Appointments Commission (NJAC). Its perusal reveals, that it is composed of the following: (a) the Chief Justice of India, Chairperson, ex officio; (b) two other senior Judges of Supreme Court, next to the Chief Justice of India – Members, ex officio; (c) the Union Minister in charge of Law and Justice – Member, ex officio; (d) two eminent persons, to be nominated – Members. If the inclusion of anyone of the Members of the NJAC is held to be unconstitutional, Article 124A will be rendered nugatory, in its entirety. While adjudicating upon the merits of the submissions advanced at the hands of the learned counsel for the rival parties, I have arrived at the conclusion, that clauses (a) and (b) of Article 124A(1) do not provide an adequate representation, to the judicial component in the NJAC, clauses (a) and (b) of Article 124A(1) are insufficient to preserve the primacy of the judiciary, in the matter of selection and appointment of Judges, to the higher judiciary (as also transfer of Chief Justices and Judges, from one High Court to another). The same are accordingly, violative of the principle of “independence of the judiciary”. I have independently arrived at the conclusion, that clause (c) of Article 124A(1) is ultra vires the provisions of the Constitution, because of the inclusion of the Union Minister in charge of Law and Justice as an ex officio Member of the NJAC. Clause (c) of Article 124A(1), in my view, impinges upon the principles of “independence of the judiciary”, as well as, “separation of powers”. It has also been concluded by me, that clause (d) of Article 124A(1) which provides for the inclusion of two “eminent persons” as Members of the NJAC is ultra vires the provisions of the Constitution, for a variety of reasons. The same has also been held as violative of the “basic structure” of the Constitution. In the above view of the matter, I am of the considered view, that all the clauses (a) to (d) of Article 124A(1) are liable to be set aside. The same are, accordingly struck down. In view of the striking down of Article 124A(1), the entire Constitution (99th Amendment) Act, 2014 is liable to be set aside. The same is accordingly hereby struck down in its entirety, as being ultra vires the provisions of the Constitution. The contention advanced at the hands of the respondents, to the effect, that the provisions of the Constitution which were sought to be amended by the impugned constitutional amendment, would not revive, even if the challenge raised by the petitioners was accepted (and the Constitution (99th Amendment) Act, 2014, was set aside), has been considered under a separate head, to the minutest detail, in terms of the submissions advanced. I have concluded, that with the setting aside of the impugned Constitution (99th Amendment) Act, 2014, the provisions of the Constitution sought to be amended thereby, would automatically revive, and the status quo ante would stand restored. The National Judicial Appointments Commission Act, 2014 inter alia emanates from Article 124C. It has no independent existence in the absence of the NJAC, constituted under Article 124A(1). Since Articles 124A and 124C have been set aside, as a natural corollary, the National Judicial Appointments Commission Act, 2014 is also liable to be set aside, the same is accordingly hereby struck down. In view of the above, it was not essential for us, to have examined the constitutional vires of individual provisions of the NJAC Act. I have all the same, examined the challenge raised to Sections 5, 6, 7 and 8 thereof. I have concluded, that Sections 5, 6 and 8 of the NJAC Act are ultra vires the provisions of the Constitution". In April 7, a three-judge bench of the apex court had referred the matter to a five-judge Constitution Bench, the batch of petitions challenging the validity of NJAC Act to replace the two-decade-old Collegium System. Under the old Collegium System, five top judges of the apex court used to recommend the transfer and elevation of judges to the Supreme Court and the 24 High Courts. The NJAC was signed into an Act by President Pranab Mukherjee on December 31, 2014. According to the new act, two eminent persons will be nominated to the NJAC as members by the committee consisting of the Prime Minister, the Chief Justice of India and the Leader of Opposition in Lok Sabha or the leader of single largest Opposition party. The eminent persons will be nominated for a period of three years and will not be eligible for re-nomination.